When Justify crossed the wire first in the Preakness (G1), setting up an opportunity for a Triple Crown in the Belmont Stakes (G1), it was inevitable that comparisons would be drawn between he and American Pharoah, who gloriously ended a 37-year drought when claiming the Crown in 2015. 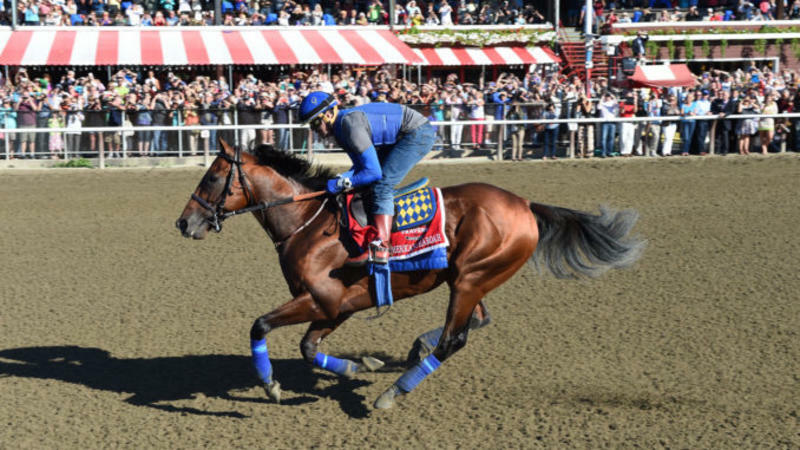 The tie that binds both colts is trainer Bob Baffert, who will be taking a fifth shot at a Triple Crown sweep. After missing his first three times with Silver Charm (1997), Real Quiet (1998), and War Emblem (2002), Baffert will attempt to win a second, emulating “Sunny” Jim Fitzsimmons, who conditioned the father-son duo of Gallant Fox and Omaha to Triple Crowns in 1930 and 1935, respectively. However, aside from the trainer, their frequent presence in the winner’s circle, and general front-running style, similarities between the two colts are few. For starters, American Pharoah and Justify took vastly different paths to the classics. Precocious enough to debut in August of his two-year-old year, American Pharoah wound up as the champion juvenile colt after back-to-back romps in the Del Mar Futurity (G1) and FrontRunner (G1). Overpowering his rivals in the Rebel (G2) and Arkansas Derby (G1) the following spring, American Pharoah became only the second two-year-old champion since 1978-79 to come back and win the Kentucky Derby (G1). Justify, in contrast, has always had to play catch-up. It’s a testament to his innate talent that he debuted as late as February 18 and, 11 weeks later, was in the Kentucky Derby winner’s circle, becoming the first horse since Apollo in 1882 to win the Run for the Roses without having raced at two. In addition to his relative inexperience, Justify arguably had a more difficult path en route to Churchill Downs, needing to win the Santa Anita Derby (G1) over a quality rival in Bolt d’Oro, generally considered the second best two-year-old in the country last year. BRIS Speed ratings are also an interesting point of comparison. American Pharoah’s were generally consistent from the Del Mar Futurity through the Preakness: 103-99-99-102-100-100. Justify’s rose rapidly from his debut through the Santa Anita Derby (100-104-114) before dipping to 102-98 in the Derby and Preakness. It’s this regression that has some wondering whether Justify peaked too soon and is vulnerable to further decline going 1 1/2 miles. It must be said, though, that Justify’s figures these past several weeks have been a function of how he’s won, forcing a fast pace in the Derby and getting hooked into an early duel in the Preakness with a high-quality opponent in Good Magic, last year’s juvenile champion. American Pharoah’s experiences were different. Taking a lead no one else seemed to want, American Pharoah set a relaxing pace, quickened slightly through interior fractions, and rolled to a 5 1/2-length win in the Belmont in one of the quicker times (2:26 3/5) in race history. Justify might not have it so easy with Louisiana Derby (G2) winner Noble Indy also in possession of early foot, though both are owned in partnership by WinStar Farm and the expectation is Noble Indy isn’t there to make things difficult for the marquee attraction. The talent and speed are there for Justify to replicate American Pharoah’s achievement of three years ago. How he’s gotten to Belmont and how he’ll potentially get around one lap of “Big Sandy” in first place has been and could continue to be a vastly different tale.